As one of California’s largest land owners, PG&E has a long history of managing lands and waters in a responsible and environmentally sensitive way. This includes protecting threatened and endangered species and their habitats, managing watershed lands that PG&E has committed to preserve in perpetuity, maintaining forest lands to minimize the threat of wildfire and managing vegetation around our overhead power lines so that customers experience fewer outages. Safe Harbor Agreements: PG&E maintains Safe Harbor Agreements with the U.S. Fish and Wildlife Service for PG&E-owned land at two locations: Antioch Dunes National Wildlife Refuge in Contra Costa County and Tulare Hill in Santa Clara County. 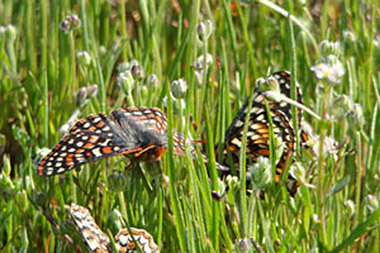 Through these agreements, PG&E is working to protect species such as the Lange’s Metalmark butterfly, Antioch Dunes evening primrose, Bay Checkerspot butterfly and Metcalf Canyon jewelflower. Habitat Conservation Plans (HCPs): We continued to implement our San Joaquin Valley Operations and Maintenance HCP, a 30-year permit covering our gas and electric operations and maintenance activities in California’s San Joaquin Valley. The HCP’s provisions cover 23 wildlife and 42 plant species and enable PG&E to maintain our operations in a way that protects these species and the habitats on which they depend. We are developing additional HCPs and other programmatic permits for our operations. PG&E worked with the California Waterfowl Association and other stakeholders to restore 500 acres of wetland habitat in Shasta County. 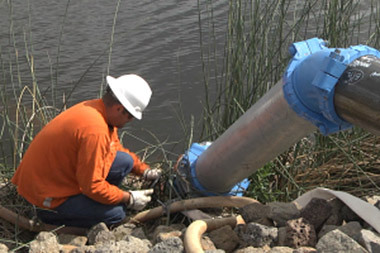 The project filters water, recharges groundwater and provides habitat to waterfowl and other birds and mammals. PG&E has an important responsibility to protect birds, both to comply with state and federal laws and to maintain electric service reliability. Our work is guided by PG&E’s Avian Protection Plan to protect migratory birds while improving system safety and electric reliability for customers. PG&E’s plan is one of the most comprehensive in the nation and we expanded it by developing an Eagle Conservation Plan to reduce impacts to eagles, including measures that make power poles safer for birds and eagles. PG&E’s stewardship commitment includes working to manage our hydroelectric facilities in a manner that restores and enhances habitat for fish and other wildlife. We also maintain 52,000 acres of forestland in ways that help prevent the spread of wildfires, which includes engaging nearby communities in wildfire prevention programs and collecting and storing seeds from PG&E forestlands for future restoration purposes. In addition, PG&E’s Land Conservation Commitment permanently protects 140,000 acres of PG&E-owned watershed lands across the Sierra and Cascade mountain ranges through the donation of conservation easements to qualified conservation organizations. Donees are identified by the Pacific Forest and Watershed Lands Stewardship Council, an independent nonprofit organization. A portion of these watershed lands will be donated to local and state organizations. We also carry out a variety of land stewardship activities at our Diablo Canyon Power Plant, including wildlife habitat management and environmental education programs. Each year, PG&E’s Vegetation Management department, in consultation with utility arborists and foresters, inspects every mile of power line in our service area for public safety and electric reliability. We do so in compliance with relevant laws and with a focus on public involvement, including extensive “Right Tree, Right Place” outreach. PG&E has been recognized by the National Arbor Day Foundation as a Tree Line USA recipient for 20 consecutive years for demonstrating best practices in utility arboriculture. PG&E earned recognition for its use of helicopters to transport crews and equipment during an upgrade of 16 miles of transmission lines from Atascadero to San Luis Obispo. 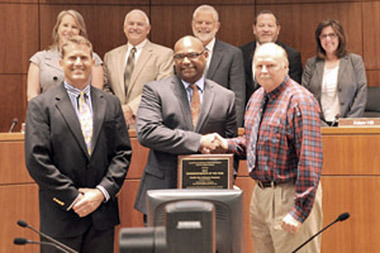 For going the extra mile to conserve natural resources, PG&E earned the Conservationist of the Year Award from the Coastal San Luis Resource Conservation. Protected bees and other pollinators by landscaping targeted lands and rights of way with shrubs and other plants that provide habitat for these species. PG&E is doing so as a member of the Pollinator Partnership, a nonprofit organization working to protect bees, birds, bats and butterflies. We are also a founding member of Business for Bees—American Business Collaboration for Pollinator Conservation Action (ABC/PCA), a commitment to manage our corporate lands in a way that protects these declining pollinator species. Permanently protected land by making the second land transfer as part of our Land Conservation Commitment, donating 151 acres in Tehama County to the U.S. Forest Service. Located in the Sierra Nevada Mountain Range, the land includes habitat for the federally threatened Chinook salmon and other wildlife and fish, and offers recreation to the public. Earned renewed accreditation from the Wildlife Habitat Council’s Corporate Lands for Learning for our Diablo Canyon Land Stewardship Program, which recognizes our wildlife habitat management and environmental education programs. PG&E manages and protects natural resources on more than 14 miles of coastline surrounding the nuclear power plant and opens the land to researchers and the public. PG&E has earned “Wildlife at Work” certification for five additional sites. Offered an online reservation system for our recreational areas, making it easier to reserve recreational areas and campgrounds. PG&E is required to maintain campgrounds and picnics at many of the reservoirs that are part of our hydroelectric system, and visitors can now easily browse photos and descriptions of these sites and reserve them online. PG&E carries out a range of restoration and habitat protection activities to fulfill state and federal regulatory requirements and to support voluntary environmental initiatives. Last year, our efforts protected or restored nearly 1,800 acres of habitat and more than 11 miles of stream and river riparian vegetation. 1 PG&E undertook these activities to meet various regulatory requirements. 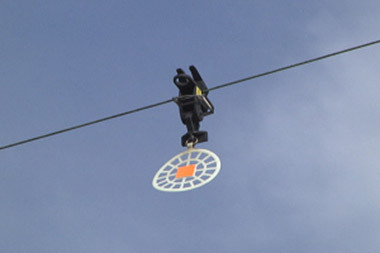 Since 2002, PG&E has made approximately 27,000 existing utility poles and towers bird-safe. In that time, we have also retrofitted more than 30,000 utility poles in areas where bird injuries, fatalities or bird-related power outages have occurred. All new poles and replacement poles in our designated “Raptor Concentration Zone” are also built to be bird-safe. PG&E’s Avian Protection Plan program focuses on compliance as well as building best practices for the utility industry for bird protection. It’s an ongoing effort to educate employees and the public, and make utility poles “bird safe’ by retrofitting them. Crews either increase spacing between the ends of the poles, creating a clearance area for any bird that lands there, or install protective covers over equipment. 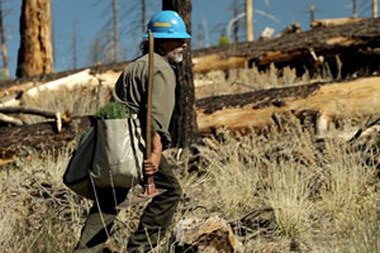 PG&E extended its partnership with the National Fish and Wildlife Foundation to plant new trees in the wildfire-stricken Los Padres National Forest on behalf of customers who enrolled in paperless billing. The trees we plant through this effort will reforest approximately 2,800 acres of the 19,000 acres that were burned in forest fires. As part of our environmental commitment, PG&E will continue efforts to avoid, minimize and mitigate the impacts of our operations on sensitive habitat and species. This includes making it a priority to work collaboratively with federal, state and local stakeholders, as well as other utilities, to seek feedback and identify best practices as we strive to manage lands and waters in a responsible and environmentally sensitive way. For example, we anticipate completing a 136-acre mitigation acquisition in 2015 to protect the California tiger salamander, California red-legged frog and San Joaquin kit fox, as part of our San Joaquin Valley Operations and Maintenance HCP. We also continue to implement our Land Conservation Commitment, donating 41 acres in Yuba County to the University of California. Given the ongoing drought in California, we will continue to face an increased risk of wildfires. In response, we have deployed active vegetation management programs on PG&E lands, improving the health of the forests while also proactively mitigating wildfire risks.